This recipe, borrowed from my mom, won first prize for me and my business associates in the salsa competition at the California Rodeo in Salinas in 1997. Just don't call it guacamole, please. That's for Super Bowl Sunday and, perhaps, your wannabe neighborhood Mexican restaurant. Key to success is dicing the avocado into 1 cm cubes, rather than smashing it into a paste. It may seem an insignificant distinction, but it makes the texture and the flavor different than that of guacamole. 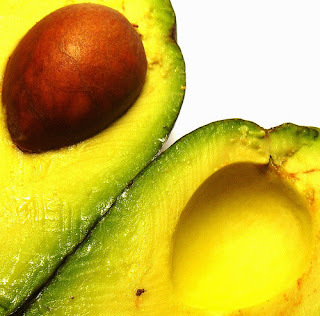 The smashing of the avocados for guacamole gives the concoction a monothematic flavor, rather than the distinct flavors one gets from each of the ingredients. 3 ripe avocados. Look for dark skin but some firmness to the touch. Slice in half lengthwise and remove pit. Cube the avocado inside its skin, then scoop out with a spoon into a bowl. Blanch a medium tomato just enough to get the skin off, then squeeze out the seeds and liquid before dicing the remaining pulp. Dice 1 medium red onion, 1-2 cloves of garlic, 2 small jalapeños (making sure to remove seeds and spines first) and 2-3 tablespoons of chopped fresh cilantro. Add all to the cubed avocado. Add a dash of olive oil, the juice of half a lime and salt and freshly ground black pepper to taste. Stir the mixture to evenly distribute all ingredients throughout. Serve immediately with home-made tortilla chips. Avocado salsa -- guacamole, too, for that matter, doesn't keep well, so don't make more than you will eat then and there. Uniform pressed, knives sharpened: Let's cook! Does this chef's jacket make me look fat? Food aplenty; so why are 960M hungry? When is a Farmers' Market not a Farmers' Market?